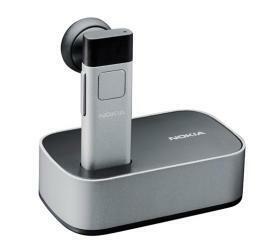 "Aside from the BH-904 Bluetooth headset that debuted at the show, Nokia also showed off its star headset, the BH-804, on the CES show floor. It debuted a few months ago, but we haven't gotten a chance to take a closer look at it until today. The Nokia BH-804 is one of the world's smallest headsets at only 1.6 inches long by 0.5 inch wide by 0.2 inch thick, and weighing only 0.25 ounce. It promises enhanced audio quality, and it comes with a tricolor LED for status indication. Also with the BH-804 is a desktop stand and a neck strap. Though it's small, the BH-804 will set you back a pretty penny: it costs around $144 retail...."